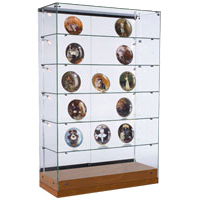 Need to buy display cases, but don't know where to begin? Due to our extensive selection, it helps to think about how you plan to use them. Most retail stores use a combination of counters, cash wraps, and register stands as the command center by placing many different fixtures into one modular configuration. 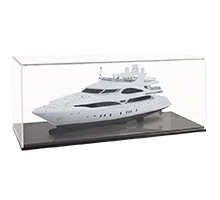 Here, employees work behind display cases to help customers and complete transactions. 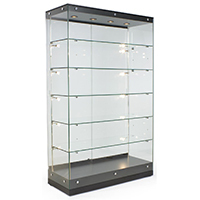 Glass tower cabinets featuring lots of shelving come in taller designs to better elevate merchandise to eye level. Pedestal models are excellent choices for gift shops, galleries, and museums, while traditional wood curio and china cabinets add that heirloom touch to any home. 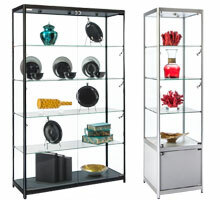 These are just some of the uses display cases provide in general. 150+ models ship out same day, so read on to learn more about our products and what they can do for you and your business. 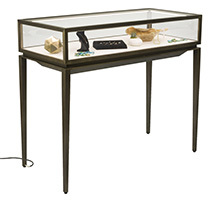 What kinds of features do glass showcases have to offer? 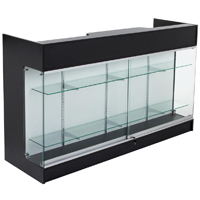 Display cases for customer interaction are, by design, counter-height affairs. This is where shoppers head to for help with an item or to pay for their purchase. 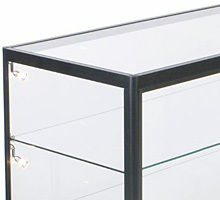 The fixtures themselves come in lots of styles; some with glass-enclosed areas for displaying merchandise and others with no glass at all as in the case of a register stand or service counter. 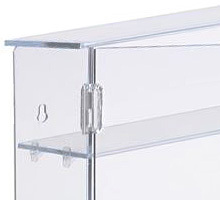 Access to items inside the cabinets can be either via the front or behind. 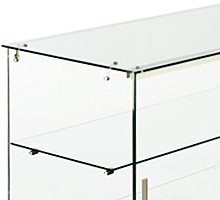 If your store sells expensive merchandise like jewelry, electronics, or other high-end products, you will want the rear access cases for security's sake. You can buy single fixtures or opt for one of our bundled solutions, consisting of configurations comprising 4 to 19 individual components. 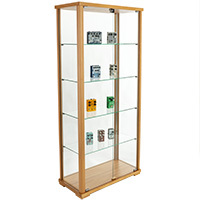 Free-standing display cabinets feature almost all-glass construction that allow customers to encircle the fixture while browsing. 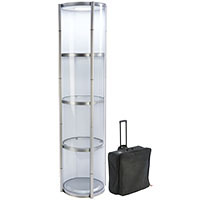 Thanks to their multi-level shelving, these cases can hold a lot more items than counter models, making them good choices for gift shops, antique stores, and other businesses that sell a lot of smalls. Pedestal styles go in the opposite direction. 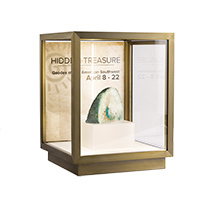 Designed for highlighting a single object, these display fixtures do an excellent job of spotlighting a priceless work of art or a small sampling of merchandise. Integrated lighting is also available on select models that further enhances the presentation with dramatic emphasis. 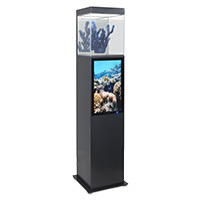 Placing a pedestal stand in the center of a room would certainly attract the attention of visitors, whether in a gallery-type setting or company showroom. Curio cabinets, with their warm wood construction and decorative mouldings, can be used for either retail or residential applications. When stocked with vintage antiques, fine china, or personal collectibles, their charm extends beyond the more modern styling of minimalist glass display towers. The curio collection brings heirloom-quality manufacturing to any interior. 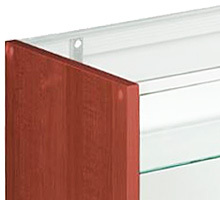 Specialty models for wall mount or countertop display offer affordable pricing in a wide variety of styles. 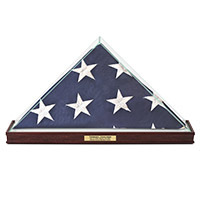 From simple dust covers to memorial flag cases, our selection offers something for everyone. 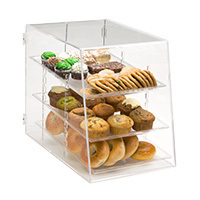 Counter top styles feature acrylic plastic construction and are perfect for protecting sports memorabilia, scale models, and figurines from dust and dirt. 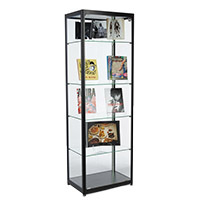 We also offer wall hanging cabinets with swing-open doors, suitable for shot glass collections or artful shadow box collages. 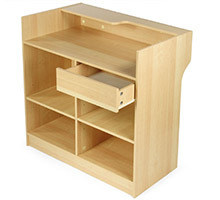 Many cabinets are available with or without interior illumination. Halogen lighting used to be the norm but newer LEDs are making inroads. Thanks to their cooler operating temperatures and more efficient power consumption, LED lighting is the smart choice for retailers everywhere. Lights come in strip, spotlight, and recessed styles, depending on cabinet make. Illuminated merchandise has the power to attract shoppers and make expensive items appear more desirable. 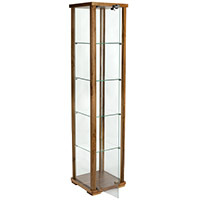 We offer a huge collection of in-stock & ready to ship display cabinets. Use them to store and highlight products, school trophies, or collectibles while keeping them free from dust, dirt, and fingerprints. We are confident you will find a perfect fit for your business or establishment. If at any time you wish to contact us with a question or offer help with a purchase, our contact center is here to help.